A melting ice cube on a plate. Knowing the difference between heat and temperature is important. It can lead to a clearer understanding of energy. 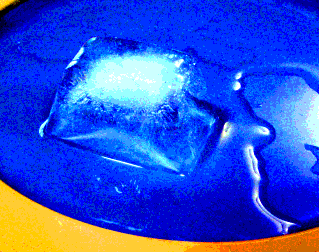 Above is a picture of an ice cube melting in a small dish. The ice, water, dish, and are experience heat exchanges and temperature changes. In this section we will define both heat and temperature and hopefully reach an understanding of how they are related, but not identical ideas. Often the concepts of heat and temperature are thought to be the same, but they are not. Perhaps the reason the two are usually and incorrectly thought to be the same is because as human beings on Earth our everyday experience leads us to notice that when you add heat to something, say like putting a pot of water on the stove, then the temperature of that something goes up. More heat, more temperature - they must be the same, right? Turns out, though, this is not true. Temperature is a number. That number is related to energy, but it is not energy itself. Temperature is a number that is related to the average kinetic energy of the molecules of a substance. Read that last sentence carefully. It does not say that temperature is kinetic energy, nor does it state exactly what is the relation between temperature and kinetic energy. Here is the relation: If temperature is measured in Kelvin degrees, then the value of temperature is directly proportional to the average kinetic energy of the molecules of a substance. Note that temperature is not energy, it is a number proportional to a type of energy. Heat, on the other hand, is actual energy measured in Joules or other energy units. Heat is a measurement of some of the energy in a substance. When you add heat to a substance, you are adding energy to the substance. This added heat (energy) is usually expressed as an increase in the kinetic energies of the molecules of the substance. If the heat (energy) is used to change the state of the substance, say by melting it, then the added energy is used to break the bonds between the molecules rather than changing their kinetic energy. So, temperature is not energy. It is, though, a number that relates to a type of energy possessed by the molecules of a substance. Temperature directly relates to the kinetic energy of the molecules. Temperature can be measured in a variety of units. If you measure it in degrees Kelvin, then the temperature value is directly proportional to the average kinetic energy of the molecules in the substance. Notice we did not say that temperature is the kinetic energy. We said it is a number, if in degrees Kelvin, that is proportional to the average kinetic energy of the molecules of a substance. That means if you double the Kelvin temperature of a substance, you double the average kinetic energy of its molecules. When the average kinetic energy of the molecules goes up (a rise in temperature), the average speed of the molecules increases. And lower average kinetic energy of the molecules means they have lower speed. However, a change in average kinetic energy is not directly proportional to a change in average speed. Heat is energy. When you add heat to a substance, you are adding energy. 1. The substance can experience a rise in temperature. The heat (the added energy) can be realized as an increase in the average kinetic energy of the molecules. The molecules now, on average, have more kinetic energy. This increase in average kinetic energy is registered as a number called temperature that changes proportionally with it. Note that this increase in the average kinetic energy of the molecules means that they will now, on average, be traveling faster than before the heat arrived. 2. The substance can change state (or phase). For example, if the substance is ice, it can melt into water. Perhaps surprisingly, this change does not cause a rise in temperature. At the exact moment before melting, the average kinetic energy of the ice molecules is the same as the average kinetic energy of the water molecules at the exact moment after melting. That is, the melting ice and the just melted water are at the same temperature. Although heat (energy) is absorbed by this change of state, the absorbed energy is not used to change the average kinetic energy of the molecules, and thus proportionally change the temperature. The energy is used to change the bonding between the molecules. Changing the manner in which the molecules bond to one another can require an absorption of energy (heat) as in the case of melting, or require a release of energy (heat) as in the case of freezing. So, when heat comes into a substance, energy comes into a substance. That energy can be used to increase the kinetic energy of the molecules, which means an increase in their temperature which means an increase in their speed. Or at certain temperatures the added heat could be used to break the bonds between the molecules causing a change in state that is not accompanied by a change in temperature.